A hunt enthusiast and associate of Prince Charles had been sentenced to 15 months for viciously attacking a Director of the League Against Cruel Sports. Anthony Kirkham, a member of the Cheshire Foxhounds, was convicted of robbery at Mold Crown Court. The presiding Judge, Mr Recorder Gerard Elias QC, described the incident as a serious offence which involved ‘targeted violence’. In 1995 Kirkham, 53, was convicted of violent disorder and sentenced to 12 months after attacking hunt protestors with a pick axe handle. 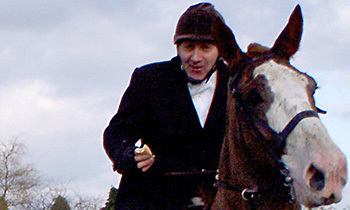 Despite his violent record he has always been made welcome at the Cheshire Hunt, and on several occasions has enjoyed a day in the field with Prince Charles. Kirkham’s conviction brings to twelve the number of hunt supporters this year convicted of violent offences against the opponents of hunting. Mr Owen’s camera, valued at £1,300, was stolen during the incident. Although it was later recovered the film was missing. On the day of the attack Mr Owen was acting as a League Hunt Monitor, recording the activities of the hunt. League Monitors are instructed to not trespass or interfere with the hunt in any way. Evidence gathered by monitors has in the past resulted in the dismissal of Masters and embarrassment for hunt apologists.